This historic five-hole outhouse was built for prominent Eureka businessman, Frederick Bartine (1888-1964). A native of Finland, Bartine immigrated here in 1901. Soon after, he prospered as owner of the Ruby Hill Water Works, the Bartine Ranch, the Bartine Service Station and two mining claims on Willow Creek. The outhouse itself has had a troubled past. It has been move numerous times and has been the center of a legal dispute. It has now found a home on the site of the old Eureka Barber Shop and is being restored and maintained through private donations. 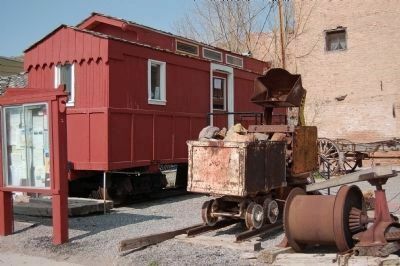 It remains the only known five-hole outhouse in Nevada. Location. 39° 30.765′ N, 115° 57.644′ W. Marker is in Eureka, Nevada, in Eureka County. Marker is at the intersection of Main Street (U.S. 50) and Ruby Hill Avenue on Main Street. Touch for map. 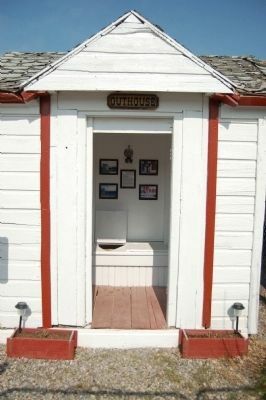 The Bartine Outhouse is part of an historical display on Main Street. Marker is in this post office area: Eureka NV 89316, United States of America. Touch for directions. The marker is to the left of the outhouse, note the shadow. (within shouting distance of this marker); Eureka Sentinel Newspaper (about 300 feet away, measured in a direct line); Eureka Sentinel Building (about 300 feet away); Charcoal Burners Massacred Aug. 18, 1879 (approx. 0.6 miles away); Tannehill Cabin (approx. 0.7 miles away); Eureka (approx. 0.9 miles away); The Eureka Mining District (approx. 3½ miles away). Touch for a list and map of all markers in Eureka. Crew Car No. 29 is next to the Bartine Outhouse. 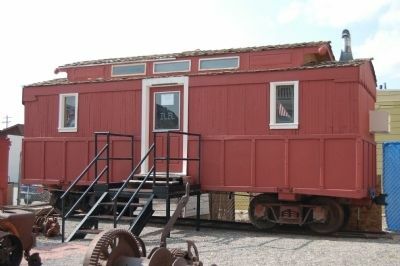 It is the only remaining piece of rolling stock from the Eureka & Palisade Railroad. More. 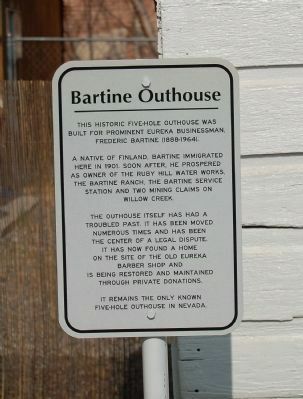 Search the internet for Bartine Outhouse. Credits. This page was last revised on June 16, 2016. This page originally submitted on January 17, 2012, by Barry Swackhamer of San Jose, California. This page has been viewed 452 times since then and 7 times this year. Photos: 1, 2, 3, 4. submitted on January 17, 2012, by Barry Swackhamer of San Jose, California. • Syd Whittle was the editor who published this page.